I have this list of “blog” things I’m trying to finish up before baby E comes, so let’s see how I do. 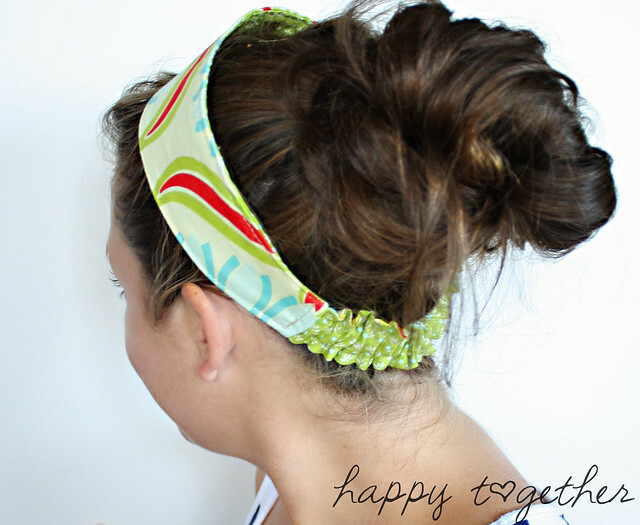 I’m starting with this one: Double Sided Fabric Headband Pattern. I had so many ask about how I made the ones for my daughter’s teachers that I digitized the pattern for all of you to use and wrote up instructions. or more elaborate ones. I made these with leftover pieces from my daughters quilt. Are you ready to make one of your own? -Seam allowances are 1/4″ unless otherwise stated. -Kid size will be made the same way except the elastic casing is so small that there is no need to do step 9. 2. 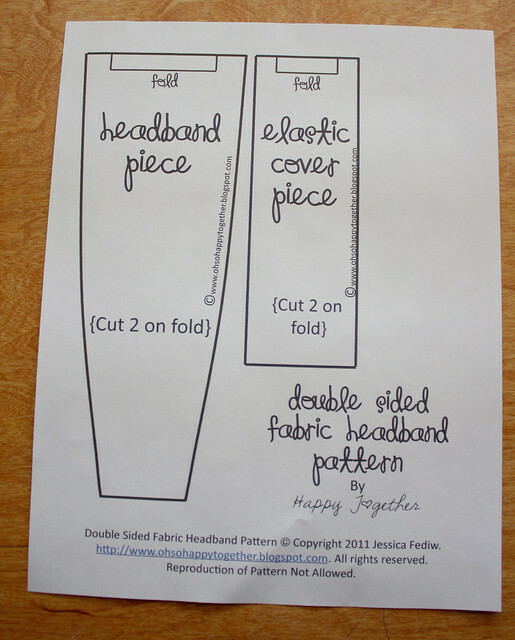 Cut out two pieces for the headband, making sure the pattern piece is on the fabric fold. 3. 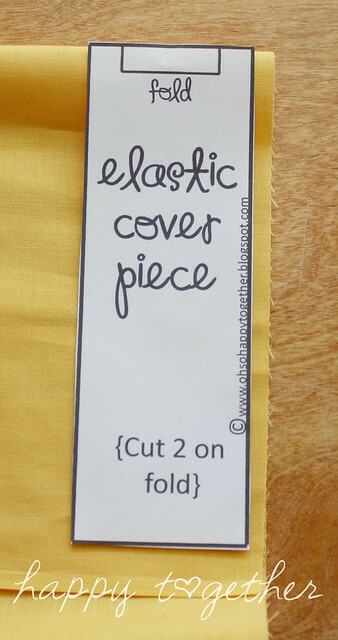 Cut out two pieces for the elastic cover (if you make your elastic piece longer, increase the length of these pieces as well). Again, make sure the pattern piece is on the fabric fold. 4. 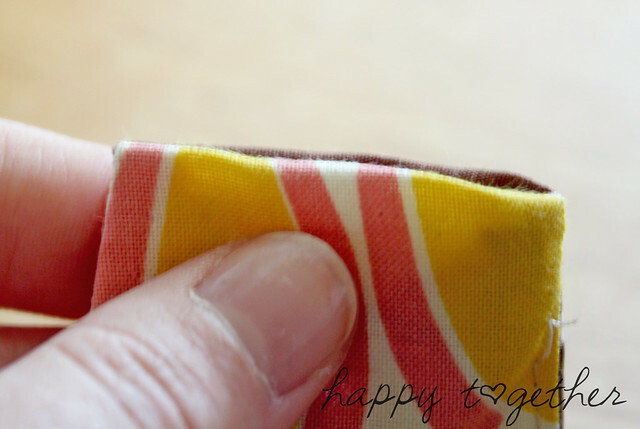 Cut your piece of elastic to be 5.5″ long. 5. Place the a headband fabric piece and elastic cover fabric piece down, right sides facing up. Then place the second pieces on top of them, right sides facing down. Make sure to match up the sides and pin together. 6. 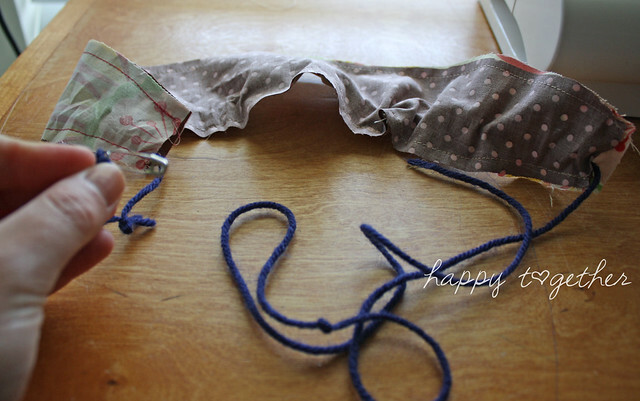 Sew down the sides of the headband and the elastic cover. 7. Turn each piece right side out. 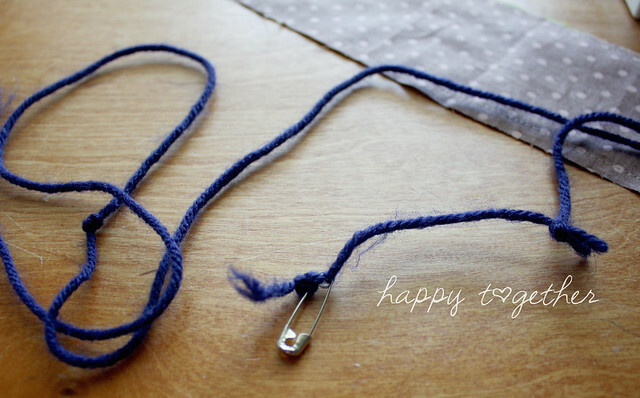 I do this by attaching a long piece of yarn to a safety pin. and then pin one side of the end. and then pull the yarn on the other end and it will be right side out. 8. I use a long stick to push out the seams from the inside and then iron, but you can just iron each piece if you like. I just don’t like the fabric overlapping on the sides too much. 9. Now take the elastic cover piece and sew down each long side. This creates a middle casing for the elastic. *THIS step is NOT needed on the kid size one. 10. 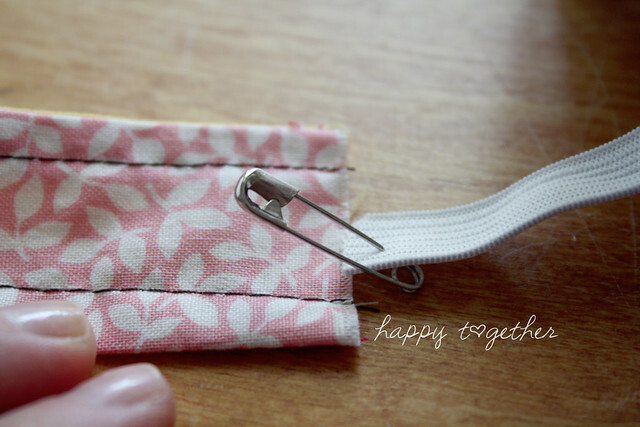 Add a safety pin to the end of the elastic and start to slide the elastic through the elastic cover. Make sure to stop before the end without the safety pin is inside. 11. Once the side without the safety pin is at the opening, sew it in place so it won’t go anywhere. 12. Continue to push the safety pin through the casing until the other end of the elastic is at the other edge. Sew that in place as well. turn in some so no raw edges are showing. 14. 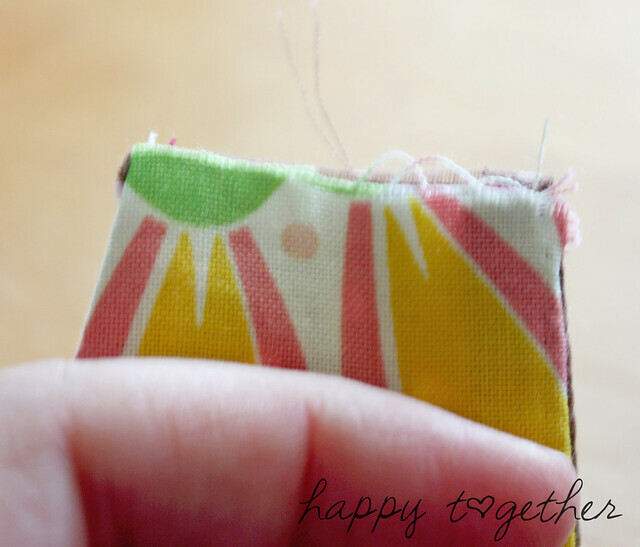 Slip in the elastic band until the place where you sewed is no longer visible and sew in place. 15. Repeat #14 on the other side. 16. Top stitch the sides of the headband part if desired (I sew closer to the edge than 1/4″). They are simple to make and if you plan it well you can whip up a bunch at the same time assembly line style like. Then you have a bunch for yourself or gifts for the ladies in your life 🙂 Most of these will probably be Christmas presents. Great, huh? And it’s only July!!!!! 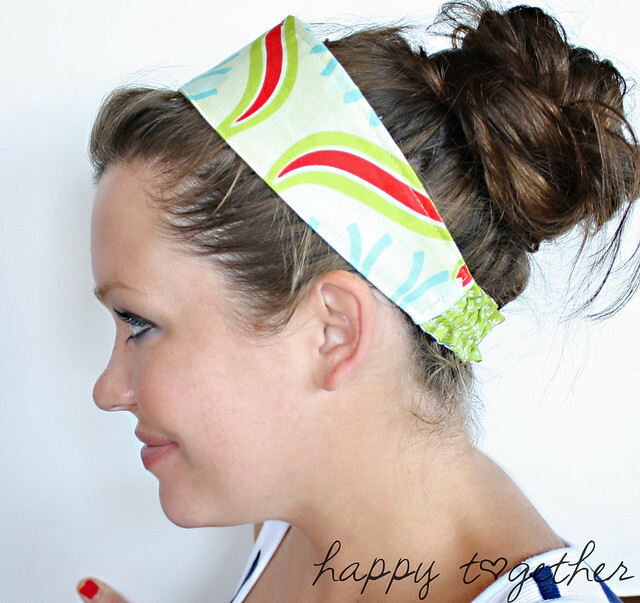 Don’t forget to check out 6 ways to style your headband too. Thanks for sharing now i can get started make me some new ones.thanks again. Yippee! Just as soon as I get through the backlog I have going here (and am feeling better!) I so have to make one of these! thanks for the pattern. I am looking forward to printing the pattern out and start on some this week. Thank u for listening to us! You’re awesome! Hi, thanks for this great tutorial. It’s awesome! so cute!! !thanks for the pattern. So cute! I like so much your blog! I view it very often! Big Kiss from France! These are too CUTE! My girls and I are going to make some this week.. My oldest goes to camp this weekend and wants to make some to give to her bunk mates. Thank you for sharing!!! Great tutorial! Great tutorial…I made my daughter a headband recently without a pattern and messed up the elastic band, so I particularly liked this post!! Thanks! Thank you for this great tutorial! I have tried it right away and made 2 headbands for my girls. I was surprised with the result – I have never sewn anything more difficult then a pillow but the headbands were easy to make and look wonderfull! Where do you find these SUPER pieces of fabric? Well, a lot of it comes from Joann’s but some are designer prints you have to buy online by Heather Bailey. I love this headband! I’m posting a link on my blog to it, hope that’s ok! so cute! I have made this style of headband before but never thought to cover up the elastic! Love it and plan to make 10 of my own. I really like the tutorial,thank you. I love this headband. Well done and thanks! THANK YOU!!!!!! These are superb! What an excellent guide! I’ll definitely be trying this soon. Thanks so much for sharing! oh my goodness you have some great projects. i love the little pin cushions. i have 2 seamstresses in my family and i’m going to make a couple for them for christmas. thank you so much. I love these headbands. We’re having our family reunion this week and this is gonna be a great little gift. I decided to make one for each of my nieces. Great instructions, too! Thanks!! Hi! Have you made these for little girls? How would you adjust the measurements accordingly. Does the elastic allow for different sized heads pretty well?? I haven’t made them for little girls yet, but it wouldn’t be that hard to resize. Give it a try 🙂 The elastic allows for a few extra inches for heads. Of course, adjustments can always be made if necessary. 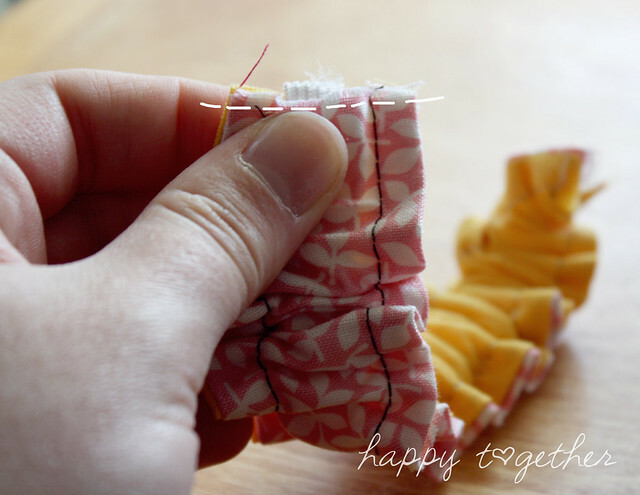 If adding a longer piece of elastic, just stretch it as far as it will go and measure it. Then that is how long you should make the casing for it. So is the elastic the same size as the casing or shorter. I didn’t stretch my elastic. I made both the same length but didn’t gather it yet or sew the other side. I sewed one side and am going to wait it see what size to make it. I appreciate an input. Just wanted to say I love your tutorial. I just made one for my 2 yr old daughter with some slight modification to make it smaller. This is great! LOVE it! I am making these for my girls (18) for our church young women’s camp! So easy and so perfect. A great alternative to a bandana! 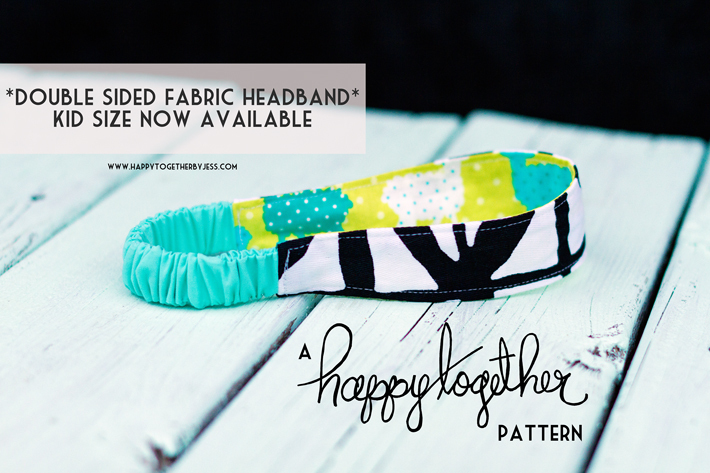 I’m blaming my pregnancy-brain, but I cannot figure out how to print out your lovely pattern for headbands? (Other than printing out your blog post and guessing on the sizing)? Is there a direct link to the printable pattern? I really want a couple of these for my hospital bag (and just summer in general – SO adorable!) Thank You! Oh my goodness – ignore please my last comment – I *just* saw the link to the pattern download. Oh I feel so silly, I swear I’ve read your post in entirety at least 3x and I *just* now saw the link. So silly. I can’t wait to get started on these, they are so sweet! I also just “liked” you on fb and will enjoy hearing more about your adventures with crafts and kidlets! These are so cute! I’ve made a couple already but mine keep slowly slipping up and off my head. I’ve tried using longer length of elastic but no go. Suggestions? Maybe try not putting the cover over the elastic? The the elastic might cling to your hair better and keep it in place. You could also try using fabrics with some kind of texture that would help it kind of cling to the hair more? Or just add a bobby pin or two to hold it securely in the back? Thanks for sharing it!! I have worn my new headban to the grocery store, hancocks and around the house all day! ha! thinking this is PERFECT for all of those small bits of fabric I can’t bring myself to get rid of. What a great tut! Thanks for the yarn trick! Unfortunately I am not selling any at the moment. But, my pattern is free for anyone to make and sell so you can probably find some making these on Etsy or something similar. Wow, super cute! I just made one as a sample for my Girl Scouts. These would make a perfect “troop identifier” for our upcoming spa-themed event. Thanks so much for sharing with us! Thank you for posting this tutorial. I found you on Pinterest (my obsession). I plan to make some of these to gift to my neices for Christmas. I love how cute and simple they are. Have you come across anyone that’s selling these? I’d love to have a couple but don’t have time right now to make them myself. I found a couple on Etsy but they’re not this cute. if you want you can contact me at my email ohgretadesigns at aol.com or you go to my web site http://www.ohgreta.com and contact me. Thanks so much for sharing. Perfect project for my girls for 4-H this next year! Thanks for a great tutorial! 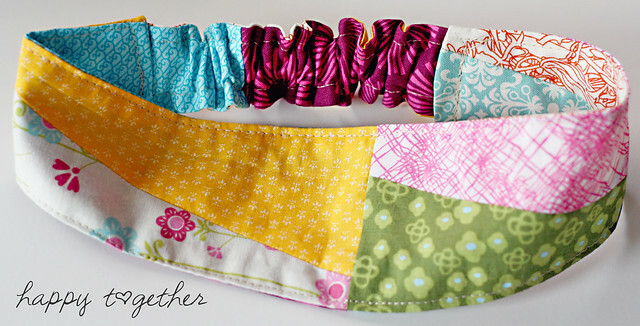 Check out the headbands I made at http://www.leaandlars.blogspot.com. Can I sell headbands made from this pattern? Love these…can’t wait to make my niece some! Oh wow those are super cute, I want to make them for Christmas gifts for the girls makes perfect stocking stuffers. Thanks for sharing! thanks so much! this pattern is awesome and just what i was looking for. Love these! I have tons of fabric scraps from other projects so this will be perfect. The only thing is I kinda have a flat head at the back so I don’t know if these will stay put on me. Will still have to try 🙂 Thanks for sharing. Thanks so much for generously sharing this pattern and tutorial! Just finished my first headband and loved it, so much fun! Time for more! Thanks for sharing your pattern! I made several of these today to give as Valentine gifts. They were fun and easy to make! Buy Marimekko fabrics at affordable prices for your projects! 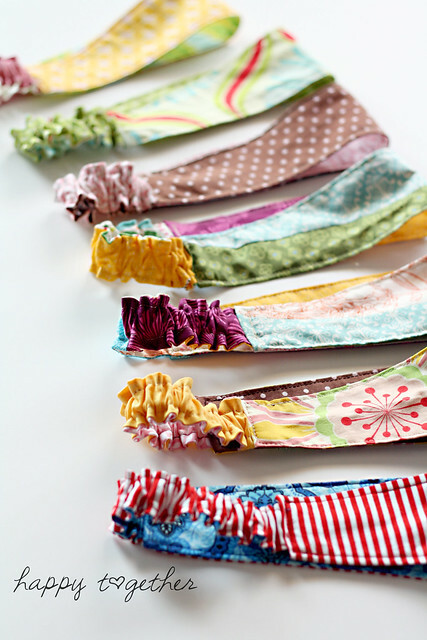 I am so excited to make these super cute headbands…I am a very very beginner sewer…you think I will be able to do them? hese are absolutely adorable…I am a very beginner sewer…you think I will be able to make them? Yes! I believe in you 🙂 You can do it! Just take your time and take a break if you get frustrated at all. 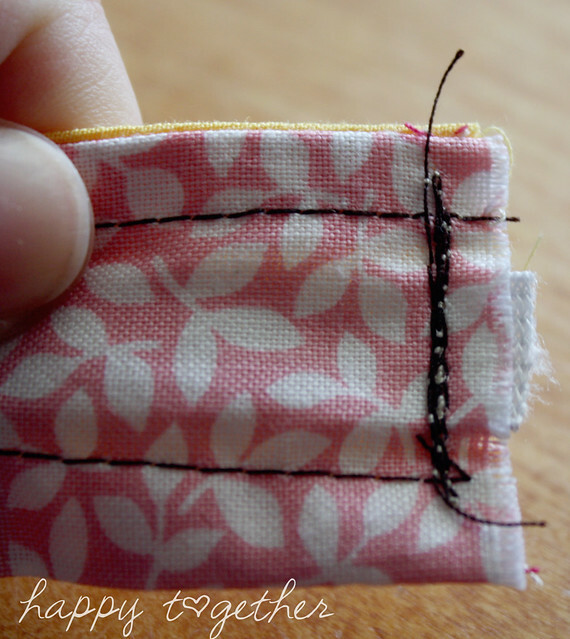 It can be hard at the beginning when learning to sew, but the more you sew, the easier it becomes! 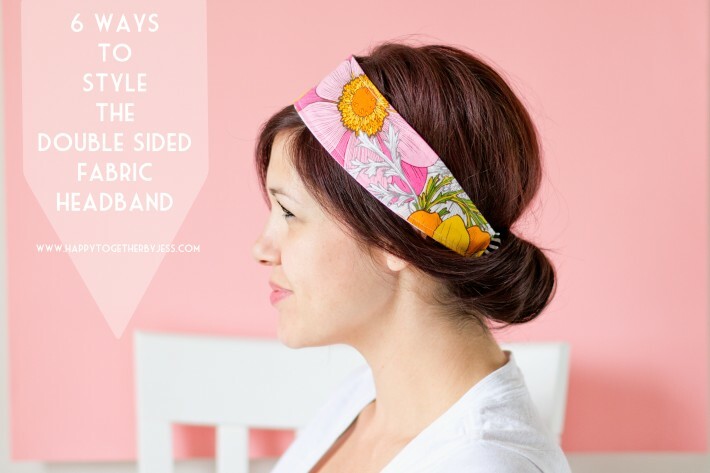 The fabric of the headbands looks gorgeous!Thanks for sharing the tutorial & pattern. This is SO super nice of you to offer. I haven’t read through yet but thought I’d send out a thank you while the pattern pieces are printing. I have a bohemiannie! bag pattern that I’d like to give you if you’re interested. (I sell them but would like to give you one). You can find it on my blog on the left near the top if interested. Thank you, Thank YOU! Ooh, I love these! 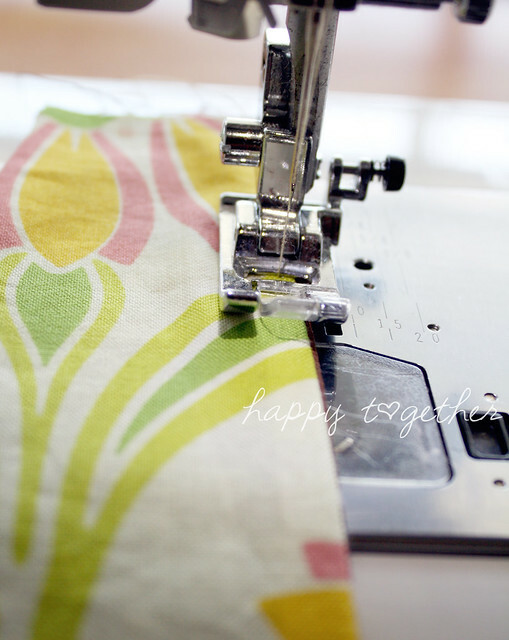 I’m learning how to use my old sewing machine and this would make a great project. Any suggestions for sizing them for a little girl? Thanks! Can’t wait to try sewing a few of these! Thanks for the tutorial! I would love to make some of these, but every time I click on the pattern picture to try to get it, it keeps telling me I don’t have permission to view the picture. I did join the flickr group so not sure what I am doing wrong. Do you sell these? I would really love to buy some! These are so stinking cute! Just made one for myself and one for my daughter and we are in love with them! Thank you so much for sharing this! I was wondering if it is allowed to sell the ones I sew? Wouldn’t want to do it without your permission! This is great. I’m getting together a collection of mothers day gift DIY sewing projects. This is perfect. Thanks for sharing! Yes ma’am 🙂 You definitely may sell headbands you make! Thank you so much for the pattern. I make shoeboxes at Christmas time for Samaritan’s Purse…and what little girl would not love to get some new headbands, handmade with love! Hi 🙂 It is perfectly fine to use a pic from my blog and link back to it. Thank you for letting me know! I appreciate the link love! These are soo cute!! I am in the possess of making one myself..and am very excited to wear it 🙂 Thanks for the pattern! I was needing a headband pattern/sweat band to wear outside in the summer, will use your pattern and adjust, using terry cloth on the inside. Thanks! Fabulous pattern and tutorial, thanks so much for taking the time to do this! My step daughter plays volleyball and I have seen these at some of the touranments and have been wanting to make them for her team and didn’t have a clue on where to start! Thanks for putting this on here! Can’t wait to get started! 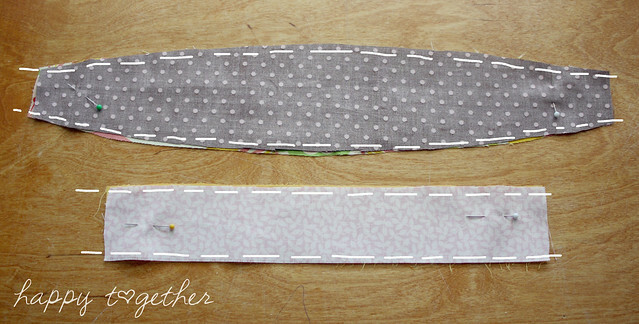 Probably a stupid question but what changes do I make to the headband pattern if the line on the pattern is more than one inch? These are adorable and am planning on making a bunch of them. 🙂 I have those days a lot! lol. If you just make the elastic and casing longer it would be an easy fix. I just made the casing as long as the elastic would stretch out when creating the pattern. 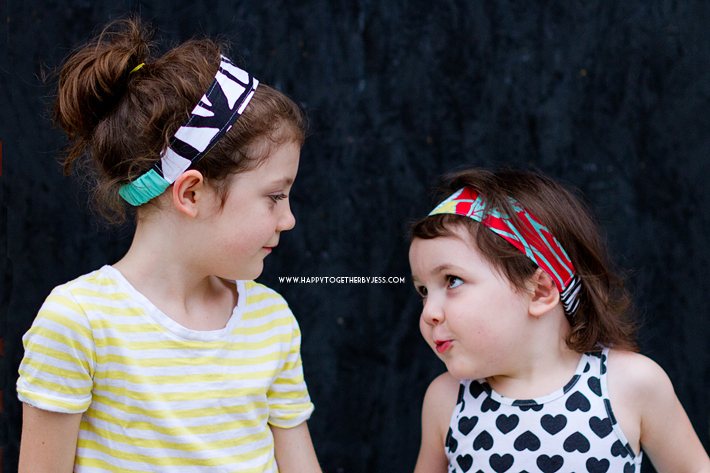 Love the fabric you used on these headbands. Looks like something I would do. Thanks for sharing your pattern. I just started wearing something like this to keep my frizzies hidden! Can’t wait to finish my current project to make some of these. I made several of these as soon as I saw the pattern. 5.5 inches of elastic is not nearly enough to go over the head. I increased the elastic to 7 inches and lengthened the band to between 16 and 18 inches (depending on the fabric I had available). I used bandanas as the fabric for both sides. One is a hippy Love print, the other is a blue camouflage. Next will be a red watermellon print, and then a blue star patriotic print. These are mostly for an exercise class and are especially good for long hair that doesn’t like pony tails. Just had to tell you that I SO appreciate the time you put into this tutorial, the pictures and instructions are SO clear. I made one for my daughter months ago and am about to assembly line a few more so came back. THANKS!!! Lovely clear tutorial but made it and its way too small for my head, so might adjust to fit my daughter. Agree that needs more elastic and a larger elastic cover piece… but still super lovely and i am pleased with the result! Super CUTE pattern… but it was WAY too wide for my yet… and even more so for my 6 yr old’s head…. Thank you so much for all this work. I look forward to making this for my little girl! Thank you so much for taking the time to create a pattern and tutorial. I had been making these headbands for awhile for my 4 year old daughter but could never get the sizing right – until I found your tute! Also, the addition of the elastic casing is *very* professional looking and polished. I will never go back to plain elastic backs after this now that I know how to do it neatly. ps. I went up to 6.5 inches with the elastic and found it fits alot nicer. My daughter and I have large heads maybe? lol… I guess it depends on the elastic you use in all seriousness. I used half-inch braided elastic. It stretches nicely and doesn’t hurt. Woven elastics are too stiff IMO. Thank you so much for posting this tutorial!!!! very well done! Thanks for the awesome tuorial! LOVE your headbands. Thank you so much for thie tutorial ! I am so hooked on headbands !! So cute. I can’t wait to make some. Thank you so much for sharing the pattern and tutorial! Many thanks for this tutorial! I’ve made 7 of these today and am eager to make more! They look professionally made! Thank you very much for the pretty pattern !!! I just made a skirt with a really adorable fabric, and I really wanted to make a matching head with the extra material–now I can :o) Thanks so much for the pattern and easy tutorial! Your headbands are so pretty! I have been looking for a new craft to start selling and that people would really like – and I think I just found it. I’m going to pull out the sewing machine this weekend. ThANKS! Thanks for the super cute tutorial. I ran into a small problem though…..because I am cheap and dont want to replace my ink in my printer I sent your patern to kinkos only to find out that you have a copy right on the pattern. Of course they wouldnt print the pattern but I am confused. In a previous post you said we could make and sell them….can you clarify it… is it ok to print the pattern? Hi 🙂 The copyright is just stating that someone can’t take my pattern and say it is one they made or sell copies of it. You are more than welcome to print it and sell items from it 🙂 If they won’t print it, maybe you could go to a library and do so? I will not be near the computer that file is saved on for a bit, so I cannot change it and then send it to you for printing purposes for a while. But, if that is what you need, just email me at jessicafediw@yahoo.com and we’ll get it straight. Thanks, I didn’t think about the library good call. We are doing them for a Super Saturday at church and wanted to make sure they had a pattern to make it easier. Just wanted to make sure, I need them pretty quickly so the library it is. Thanks again for the clarification. 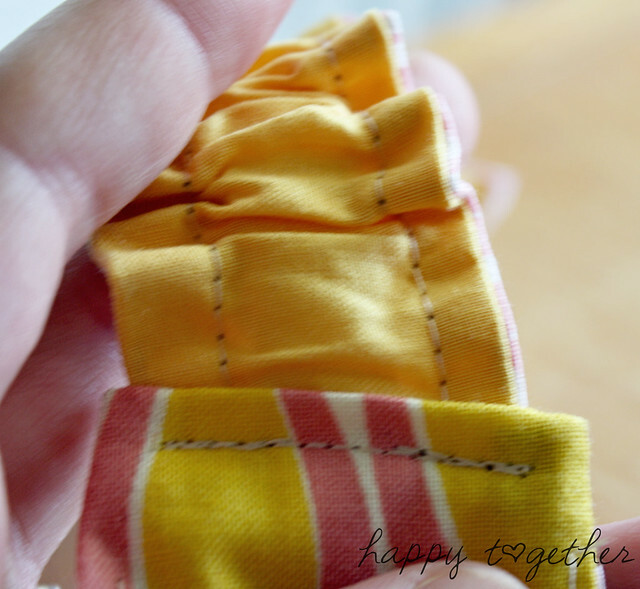 Do you have instructions on making the four fabric bands like you show in the pictures. I work at a quilt shop, one of our customers wants us to host a birthday party for her 13 year old daughter and friends. I am trying to figure out a way to have the bias seams done so the girls can just lay your pattern down and cut out the pieces. Any advice or help would be greatly appreciated. We would be glad to pay for the pattern if you have them for sale. I can be contacted at http://www.prairiequilt.com. Thank you these are great for my daughter and nieces. Thank you so much for posting these great instructions and pattern, my daughter and I just made one and it was so fun, easy and rewarding! 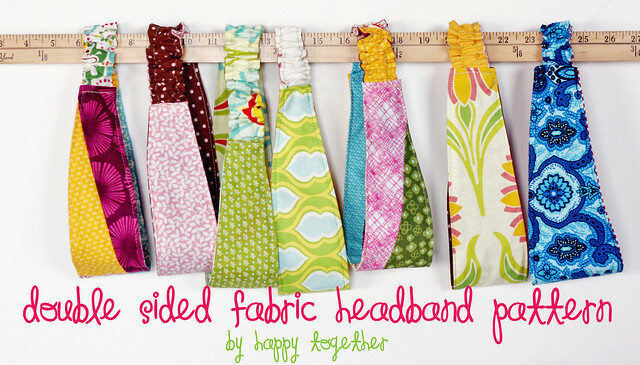 Do you have instructions for the four fabric headbands you have pictured? I would love to try those! Thanks so much for this tutorial. I had a pillowcase dress I made for my daughter that didn’t fit anymore. I repurposed it into a skirt and took the strap and made a headband for her. So, I modified it a bit but your instructions helped me get it completed. Thanks so much! THANK YOU !!! THESE ARE SO CUTE,JUST CUT A BUNCH OUT TO SEW FOR MY DAUGHTER AND DAUGHTER IN-LAW FOR STOCKING STUFFERS. LOVE LOVE LOVE THEM!!!! THANKS AGAIN!!! OMG I wanna make these all day long. I have been looking for a headband pattern and this one is detailed and well written and easy to follow. So cute and a great tutorial! Found your post via Pinterest and I’ll be repinning in hopes of making some soon. Awesome. I am making some for my daughter’s birthday for gifts for the girls that attend! Thanks so much! FIRST thanks for the clear and perfect tutorial. For little girls would u cut the elastic smaller or the headband part or both? Any suggestions would be greatly appreciated. Hi 🙂 Are you able to print out the pattern pieces? I don’t have one near me at the moment, but I can look it up and measure one if needed. I know some people have said it was a little small for their head, so they just made the elastic part longer. I just made one and am ABSOLUTELY in love with it! Thank you for such a great tutorial! Thanks so much for the awesome pattern. I just finished making my first and cant wait to make more. I love it!!! Love the tutorial and finished project, but I am having a hard time with turning the pieces right side out once sewn, any suggestions? Hi 🙂 If you look at step 7, you can see where I use a safety pin and string to easily pull it right side out. That’s the best way I have found so far. I love these so much. I just made one for my daughter with the kid pattern that is linked. The whole thing was super duper easy, i did have one issue though…when you connect the fabric/elastic piece to the headband i couldent get the rough edges of the material to fold in and there was no way that the elastic pieces were gunna fit into the little opening if i could. so i ended up just swing the rough edges over each other. they dont look as “complete” as your do, but i dont know what else to do to make it connect ant look finished. any suggestions?? Maybe should I use a thinner elastic and cut the piece that goes over it so its thinner?? Thank you for sharing! 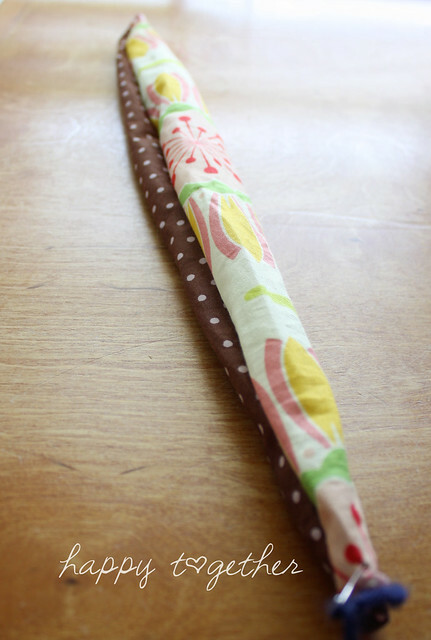 I haven’t made a little one yet, but yes, I would suggest just doing a thinner elastic or redo the pattern yourself so that the bottom ends will be wide enough to hold the 1″ elastic. Do you have any suggestions for adjusting the elastic size? I made one with the 5.5 inch and it was rather small, then I did 8 inch and it was a little big for me but my daughter couldn’t get it over her head! Just looking for a happy medium! Otherwise its perfect! Just made one and I love it!!! Thanks for the tutorial!!! Awesome headbands my mother is making one for me right now.How did u get the idea ? I love headbands! I am going to try this right now! By the way, I just found your blog and love it! This pattern is a joy to make! The instructions are so clear, and the head bands turn out so cute. Thanks so much for sharing your time and talent with us! Such a perfect project for my 4Hers! Thanks! I love this tutorial! 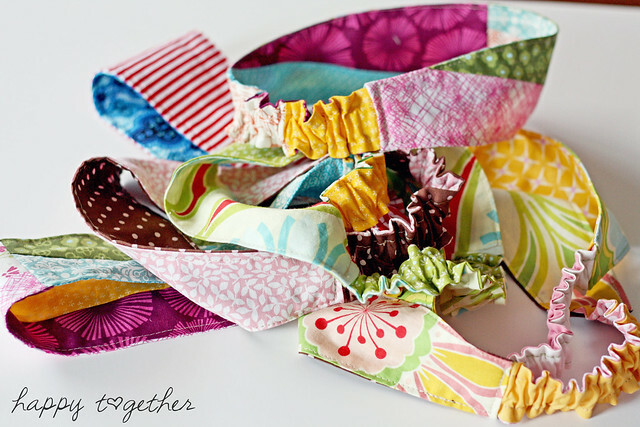 It’s so easy to take scraps from a project and make a cute, matching headband. I started teaching sewing lessons at my house for our homeschool program, and this will be our first thing to make on the machine. By the way folks, it’s easy to adjust this pattern for younger and smaller heads. Just stick it on your printer/scanner, shrink it down by 15%-25%, and voila…that’s it. 😉 I found 15% to be just right for my students, who are 8-11 years old. Thanks for the how to make it for little ones! sooo very adorable…& EASY! I really appreciate you sharing your idea! Thank you for the great instructions and pattern. I made some tonight and they are adorable! Thanks again! And have a beautifully creative day ahead! Thank you for this great tutorial and pattern. I am featuring this post on my blog! Brilliant, thank you. It’s the first time I’ve made a headband.. pretty new to sewing, and your step by step made it really easy to follow and I’m very pleased with the result. yay! These are so cute and thank you for sharing! I don’t understand where the patterns shows “cut 2 on fold”… Should I actually cut through the fold or am I supposed to have a double piece of fabric? I’m picturing if I was cutting a heart out of paper. Do I want the whole heart or just half? Hi Lauren 🙂 Good for you for teaching yourself to sew! That’s what I did. So, you do not want to cut the fold. You will see that term a lot on sewing patterns. You cut “the whole heart”, not just half. The “fold” is literally just where the fabric is folded. Thank you for the pattern. My daughter loves it. I have also recommended your website to my friend who loves the headband. I am taking a mission trip to Uganda in December and to support my trip I am sewing a bunch of different items and friends/family are buying them. I made my first one tonight, came out great especially since I really am a beginner when it comes to seeing. Thank you so much! Love these headbands! I think I am doing something wrong because the elastic casing doesn’t gather like yours does. Rather than stretching and shrinking it’s pretty flat. Should I be cutting the elastic smaller than the elastic cover piece? Should it be snug when the elastic goes through the cover piece? I tried to download the pattern, but when I tried opening it on Adobe there was nothing there. What do I do?? I’m not sure 🙁 It should be there. Feel free to email me at jessicafediw@yahoo.com and I can email it to you and see if it will open correctly for you then. Thank you for the headband pattern….I’m going to make some for my granddaughters, daughter, and daughter-in-law. Love it…..
Hello! Thank you for sharing this tutorial. I am from the Philippines teaching young kids how to sew. I would like to inform you that I used this pattern to teach my students and we made a whole bunch out of our scraps. We are joining a village bazaar in our neighborhood this weekend and we will be selling the headbands that the kids made. Proceeds from our sales will be donated to help our brothers and sisters in the southern part of our country who are now suffering the devastation that Typhoon Yolanda/Haiyan had left them. 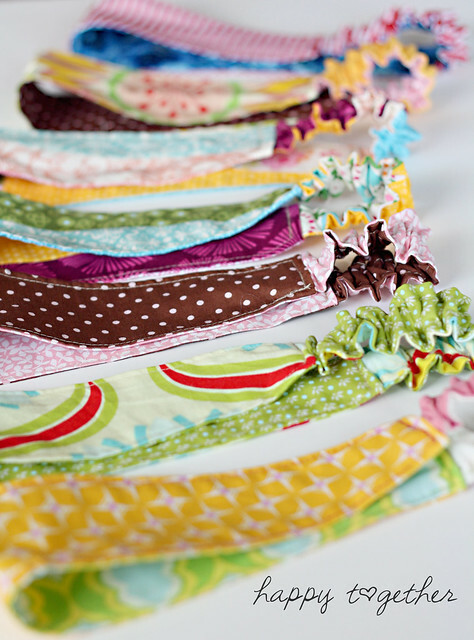 You may check out how the headbands turned out in my facebook page “seweasyforkids”. Please know that I consider you to have been part of this humanitarian effort. Thank you so much for blessing us with your wonderful creative talent and for being generous in sharing it. God bless you! I made two of these today and added quilting batting to them and the kids used them to cover there ears to keep them warm since it was like 29 degrees and windy tonight.. they loved them.. I loved your headbands! So colourful! Your tutorial inspired me to do some similar ones for my little girl! Thank you so much! I just wanted to say thank you for sharing the pattern and providing easy step by step instructions. I made two headbands today and am feeling rather proud of myself, so again I thank you for sharing. Awesome. Your instructions were easy to follow and the pattern is wonderful. Thank you so much from me and my daughter who loves the headbands! This was my first sewing project! Instructions were great. Thanks! Thank you so much for this pattern and tutorial! Cant wait to make a few for myself and my daughters. Also, THANK YOU for letting us sell what we make from your pattern! Thank you for the tutorial. I am hoping to make 1 or 2 tonight to go along with a few other things I would like to make for a birthday gift tom.. Also thanks for sharing the smaller size one too. Hi Linda 🙂 Yes you may. Thank you for asking. I allow for any of my tutorials/patterns to be used to create things to sell for profit or fundraising. So glad you can use it! 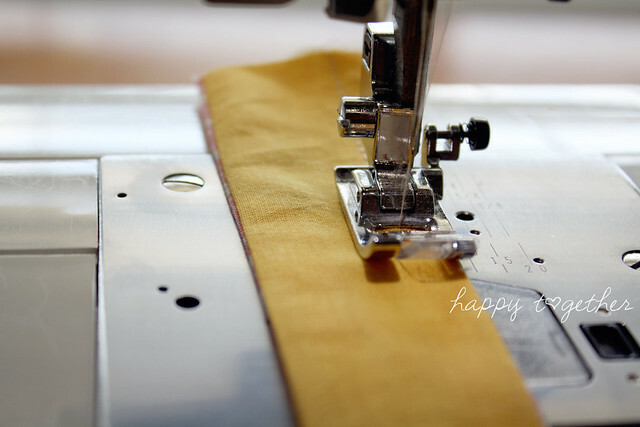 You are welcome 🙂 Happy sewing! Thank you so much for the printable and tutorial! I love this headband and finally made one yesterday, after pinning this tut ages ago and printing the pattern months ago! Here is mine: http://instagram.com/p/n7EFQMQD5N/ Thanks again! We are using your headband pattern and instructions as a “prize” for the 25 students in our 4-H Club week-long sewing camp. I have cut out the pieces and each student will receive the fabric pieces, the elastic and directions, all wrapped up in a cellophane bag with a ribbon. These will be given out to everyone at the end of our “Craziest Hat Contest” tomorrow. Thanks so much for sharing, and for the very well written instructions. 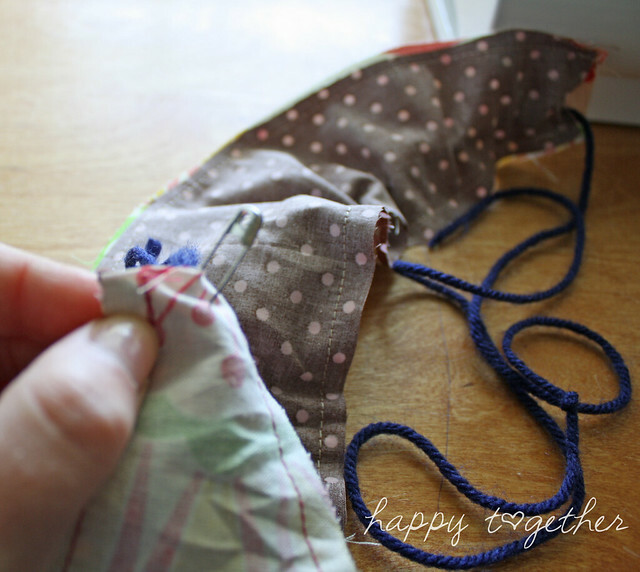 I am only a beginner sewist, and I can follow along easily, so I know my girls will “get it,” too. Oh how fun!!!! Now that’s a camp I wish I could have gone to when I was younger 🙂 Thank you for sharing! Thanks for the pattern, I was making some pocket tees (pockets to sew on t-shirts, some with monograms, some with out, and my daughter asked if I could make her a matching headband, how creative of her to think of that. Thanks so much for the pattern, can’t wait to make these, this will double their gifts, – pocket tee and matching headband!!! Thank you SO much for this tutorial!! I have looked at about 30 headbands and this is by FAR the prettiest and most well done! My search is over. You’re great!!! Yay! So glad you like it 🙂 Happy Sewing! Hi 🙂 I do not unfortunately, but I know that the lady that created it does speak English if you would like to email her. Or I would suggest using google translate maybe? It would be made the same way as the adult size, just a different length of elastic. I’m going to post on my blog later this week, if you wanna take a peek. I will totally give you credit! I made my first headband as per your instructions. The practice one I did was easy. I will have to extend the length of the headband part a little, as I wear the headband just above my forehead, covering my hair. I’ll be making a few for work, as my hair still hasn’t grown long enough to go into a ponytail. I may even make a few and see how well they work for sport. Thanks for sharing the pattern and how-to! Thank you, my daughter will be happy. Thx. wonderful pressie for an aussie summer xmas. Good explanation. I liked the part with the safety pin. 3 Cheers. I loved this! Thanks! But one question. How long is the kids’ size???? Mine came out roughly around 18.5″ unstretched and stretch to 24″. You can shorten any part to fit however you need 🙂 I did the measurements for these headbands like this: The top length equaled the length from bottom of one ear, over the head, to the bottom of the other ear and then I added seam allowance. I played around with the width until it was on I liked and then the elastic casing length was just double the length of the bottom of ear, around bottom of head, to bottom of other ear. I kind of played around with elastic length as well. I hope that helps with understanding if you need to resize and create a pattern yourself. Wooot! New sewer here and this was my very first project! It was pretty exhilarating, especially once it came time to insert the elastic. Pretty mind-blowing how that worked itself out. Thank you for the great pattern and tutorial! 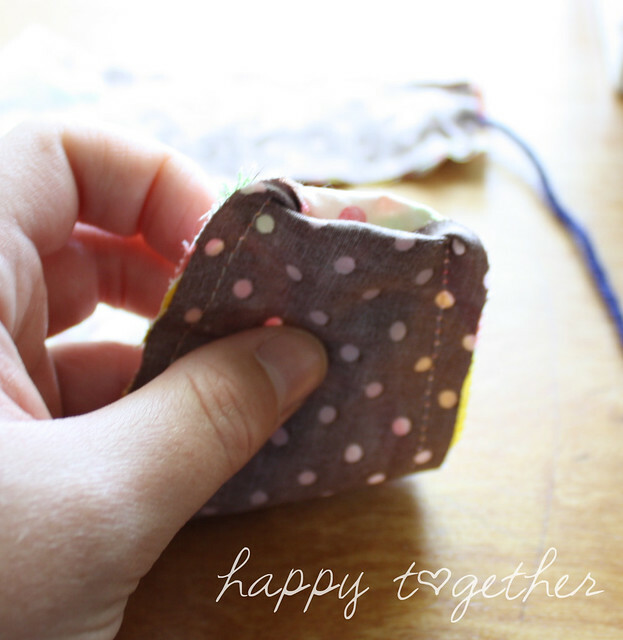 I recently found this tutorial and have been sewing up a storm! I’m making these headbands as gifts for all my favorite girl’s (both big and small) for Valentines Day. Thanks for making this easy! Love your blog too! They are so pretty! I tried making one but my elastic wouldn’t bunch! I was so disappointed;( Oh well maybe next time:) They look very nice on Dorothy! This is a great pattern! I have all these scraps of material from the dresses I’ve made and true to nature have said…”oh, I’ll keep these JUST in case I can use them for something else”. WELL….my “something else” just came in!!!!! So easy, so fast – not to mention how great they look with a matching dress! Awesome! Thanks so much. It can be a bit tricky since it’s such a small thing 🙂 I hope you were able to get it to work. Just what I was looking for! Off to sew and thanks to all who comment with tips and ideas. Thanks for sharing. Thanks for this great tutorial! The pattern is super cute and easy to make. I sewed it up for my niece (http://harmonythroughimperfection.blogspot.fr/2015/07/where-i-surrender-to-cuteness.html) and she loved it! I loved this! so easy to do. WAY too small for my head. but thats my fault i should have known better. I have a huge head. Mine is fall/thanksgiving themed. one one side there are fall colored owls and on the other there are turkeys and it says gobble til you wobble. i love it! Thanks for posting! Great tutorial, regular headbands are just too tight. This is going to be fun. Thank you for your patterns and for the tutorial! You are appreciated. I have made so many of these! They are perfect last-minute gifts. Thanks so much for this tutorial! We used this in Family and Consumer Science class for a sewing lesson and the girls LOVED them!!! Thanks so much!! thank you for pattern is beatifful! I have made so many of these! So great. Many thanks for sharing with us. thanks for this, found it last week ,so easy I have made some for myself, my daughter in law & granddaughter. Hi Jess, thank you for a great tutorial, I’ve made several of these headbands to have around the house. I’ve even referred to your tutorial in one of my posts. Thank you again and well done! If you cut the headband pieces on the bias instead of on the grain, the headband will shape itself to the curve of the head and fit better. Lindas! gostei bastante, obrigada por compartilhar. Beijos.. I didn’t see the step for topstitching the headband; if it’s missing, perhaps you can add the “press and topstitch” step. They look great! Thank you for your wonderful tutorial. I made a couple for myself, my daughter, and my granddaughter. I found that I wanted it to be a little bit stiffer so I added a layer of lightweight fusible interfacing. 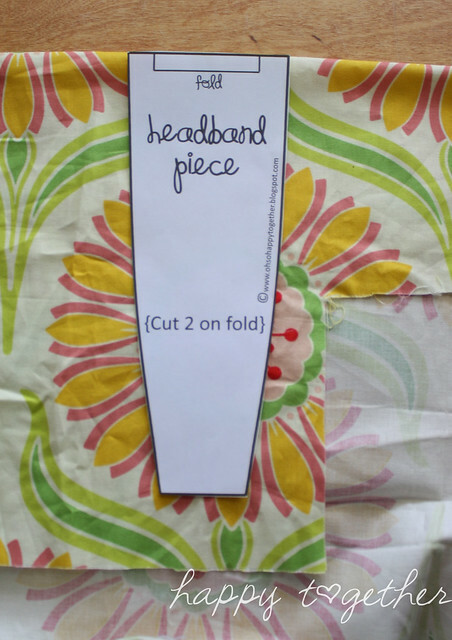 With or without the interfacing, it is a great headband. I just made the adult headband and it was so easy and I love it! The only sad part is I must have a big head because It won’t fit me! :'( I think it will be easy to fix though. Hi, my headbands are thinner than the ones you show, can you advise what ‘the above line should equal 1″ when printed” – as stated on the pattern. Thanks. Maybe that is why my attempts are thinner ? Hi 🙂 Well that line should measure 1″ and if it does the top of the headband piece pattern should be just over 3″ and the elastic cover piece 1.75″. 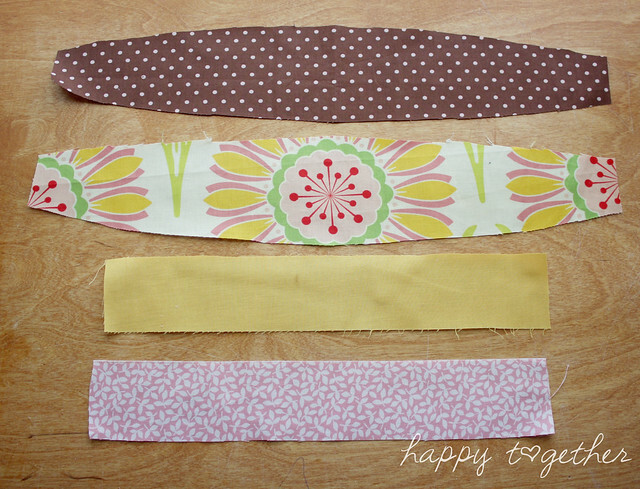 If those are all correct, you might just sew a larger seam allowance with than me 🙂 You can always add width to your headband pattern pieces to make it work for you. Let me know if you have any other questions and we will figure it out. How long do you cut the elastic? I’m excited to make these. No matter how I change my settings the line prints to 7/8ths. Is that close enough for these to still come out OK or should I make an adjustment somewhere?